By the beginning of Winter (Soviet-Finnish) 1939-1940 war, Pitkäranta wasn't a parish center and there was no lutheran church. There was lutheran praying room – Rukoushuone – in north-eastern part of village, located in former machine compartment of mine elevator. This building, as many other ones in continental part of the village, was burnt down during military operations. Today's Pitkäranta lutheran community was registered as a parish of Estonia Evangelistic-lutheran Church November 4, 1991. The parish got a small wooden building of former musical school on Lenin street. In June 1997 a foundation of wooden church was laid on Gorky street. A building process went with the financial help of Kuopio (Finland) diocese. 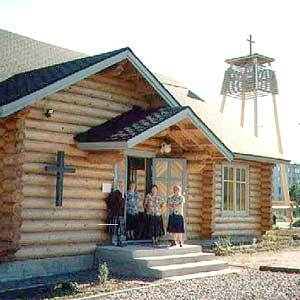 February 22, 1998, the church was blessed by Ingria Evangelistic-lutheran Church bishop Aarre Kuukauppi.